I’m a sucker for anything creamy. Trouble is, most creamy things have cream. And possibly eggs. And lots of sugar. But not Homemade Yogurt. 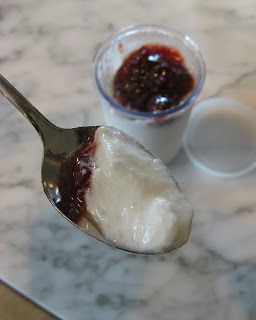 Homemade Yogurt is health food, not dessert, so I can eat it all I want. Gently heat the milk to 180ºF. Let cool to 115ºF. Whisk in the yogurt. 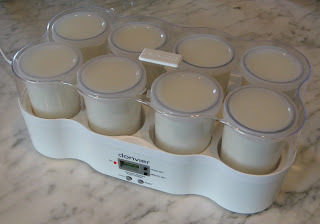 Divide the mixture among the yogurt machine jars, cover, and culture in the yogurt machine for 5 to 6 hours, or until thickened. Makes 8 servings. Scalding the milk will eliminate any existing bacteria that might compete with the yogurt culture and ruin the yogurt. To cool the milk quickly, use an ice bath. Yogurt keeps refrigerated for a week or two. Reserve a portion of this batch of yogurt to use as starter for the next batch. Serve with a spoonful of honey or jam. Also fantastic with Granola with Almonds & Cherries. It is good but still not as good as the yogurt we get in Europe, hoping to get it as close to that as possible.